Input text: there is a 6 feet tall clear skull 1 feet above the ground. there is a 6 feet tall silver skull -25 inches right of it. 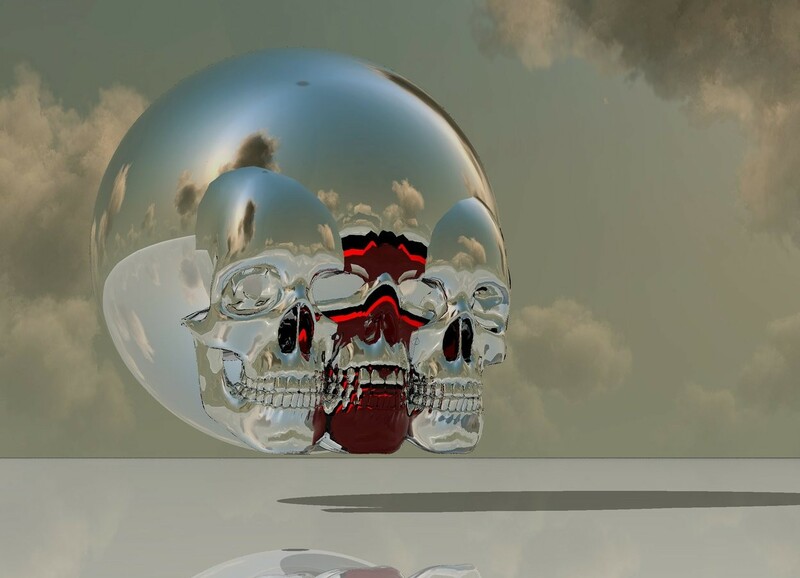 there is a 2nd 6 feet tall silver skull -25 inches left of clear skull. a 6.3 feet tall red skull is -58 inches behind the clear skull. a 6.5 feet tall black skull is -61 inches behind it. a 7 feet tall silver skull is -63 inches behind it. an 8 feet tall silver skull is -65 inches behind it. 9 feet tall silver sphere is -80 inches behind it. the ground is shiny.